Bryan Singer’s forthcoming X-Men: Days of Future Past doesn’t exactly follow Chris Claremont’s popular 1980 storyline of the same name — Wolverine steps in for Kitty Pryde as the body-swapping time-traveler in the film — but are we really expecting these X-Men movies to be faithful at this point? Enjoy the new trailer, which is pretty spectacular despite its noticeable lack of Sentinels. Make with the giant purple robots, Fox! The first trailer for Captain America: The Winter Soldier is online, and if you aren’t geeking out about it, that simply means you haven’t seen it yet. I love the look and feel of this film, which appears like more of a spy thriller than its lighter predecessor. I also really dig the banter between Steve Rogers (Chris Evans) and The Black Widow (Scarlett Johansson). Yet, perhaps the most intriguing aspect of this trailer is that this film apparently pits Cap against S.H.I.E.L.D. itself. I can’t say I saw that coming. Captain America: The Winter Soldier hits U.S. theaters in March 2014. Steve Rogers is ready to leap into action (and presumably not to his death) in the new poster for Captain America: The Winter Soldier, which hits theaters April 4. As Cap stands in an open S.H.I.E.L.D. 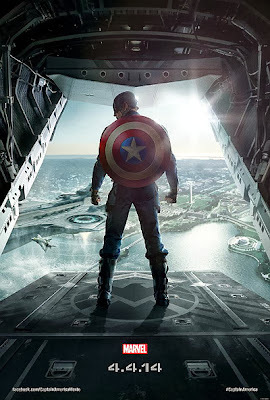 cargo hold, we catch a glimpse of the Helicarrier along with a birds-eye view of Washington, D.C in front of our hero. What does it all mean? The teaser trailer to be released later this week will hopefully answer such questions and give us plenty more to obsess about. Until then, let’s all continue to tweet voraciously about how Agents of S.H.I.E.L.D. is the best/worst Marvel thing since The Avengers/Spider-Man 3. And ... go. I usually try to avoid getting starstruck, but when I stumbled upon the opportunity to snap a photo with horror legend George A. Romero at New York Comic Con on Saturday, it was hard not to get a little bit jittery. The guy completely revolutionized a genre with 1968 zombie touchstone Night of the Living Dead and its sequel Dawn of the Dead, teaching a generation of filmmakers how combine blood-and-gore theatrics with social sensibilities. Romero also helped bring us Creepshow, which provided me with ample nightmare fuel growing up in New York thanks to WPIX’s “Shocktober” programming slate. So yeah, I was excited to meet him. It’s difficult to describe exactly what it was like to have a chance encounter with someone like Romero, the czar of zombies, but I take solace in the fact that such moments still affect me as much as they do. Tonight, more than ever, I’m damn proud to be a geek. Check out more photos from NYCC by following me on Twitter. It’s early on a Saturday, but not even sleep deprivation can stop me from being hyped about New York Comic Con, yet another excuse for the geek community to celebrate our love of comic books, movies, video games and waiting in line for things. I’ll be snapping pics of all the weirdness on the show floor this weekend, so be sure to follow me on Twitter and Instagram to experience the sights (but mercifully not the smells) of the Big Apple’s most massive pop culture extravaganza. For whatever reason, I’m not exactly clamoring for the next installment in Peter Jackson’s Hobbit trilogy. Maybe it’s because I’m not really sure J.R.R. Tolkien’s original story needed to be told over three films, or perhaps there are so many huge movies coming out in the next few months, namely Thor: The Dark World, that the next Hobbit film just isn’t registering on my radar like it should. That being said, this new trailer for The Hobbit: The Desolation of Smaug is pretty darn cool, showing us glimpses of the dwarves battling the horrors of Mirkwood and Bilbo Baggins’ encounter with Smaug inside the Lonely Mountain. The Hobbit: The Desolation of Smaug hits theaters Dec. 13. Tonight marks the conclusion of my first vacation in more than a year — seven days of comic books, horror movies, Breaking Bad binge sessions and excessive amounts of Grand Theft Auto V. I know many of you are sucking your teeth at me for not taking this opportunity to do some traveling, but I had business to take care of in Los Santos … Paris can wait. My regular Wednesday trip to Stamford, Conn.’s A Timeless Journey netted me a relatively light haul, but that doesn’t mean I was in any way disappointed with this week’s new offerings. Marvel’s “Battle of the Atom” still has me hooked despite the time-travel weirdness, and there’s definite promise in DC’s Forever Evil book, which hints at big things to come next month. I’m also thoroughly entertained by Glen Brunswick’s Reality Check over at Image Comics, which released its second issue this week.